2. While it’s OK to leave some strings and pulp on your seeds (it adds flavor) clean off any major chunks. Set out squares of this pumpkin confection alongside chocolate fudge and a fruity sweet for a pretty, mouthwatering display of confections. Line a 13x9x2-inch baking pan with foil, extending foil over edges of pan. Butter foil; set pan aside. Remove saucepan from heat; remove thermometer from saucepan. Stir in cinnamon-flavored pieces until melted. Stir in marshmallow creme and walnuts. Immediately spread fudge evenly in prepared pan. Score into squares while warm. 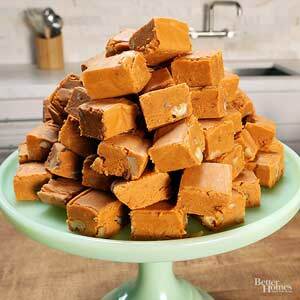 Let fudge cool to room temperature. When fudge is firm, use foil to lift it out of pan. Cut into squares. Cover tightly and chill for up to 1 week. Do not freeze. Makes about 96 pieces. Combine both mixtures and fold in the shredded pumpkin and pumpkin seeds. Once the ingredients are all incorporated pour into a non- stick 9 by 5 by 3-inch loaf pan. If your pan is not non- stick coat it with butter and flour.